I’ve watched some fancy cake shows on TV and the part that always freaks me out is when they have to transport it to a second location. It seems like nobody has come up with a better system other than setting it down on the floor in the back of a van. I guess it’s good that the actual creators are delivering them. For some reason I imagined it would be more like the cakes people get from the grocery store. But I guess they would show up to the fancy cake shop and suddenly realize it won’t even fit in their little hatch back. Also, check out this guest comic I did for my friends at Unshelved! Wow… I guess the people who used to live about a half kilometer away from here got a *huge* birthday cake (and someone had lit the candles!) with the mail a little bit less than a week ago, as that apartment house got burnt down to the ground in a huge fire! …But luckily nobody died! Have I got a cruel sense of humor? Ffft….send ANYTHING through the mail and it’ll come back folded, spindled, and mutilated. Especially if it is your jury duty summons response (ripped to shreds). ZeoViolet, I never needed to do jury duty on account of my mental disabilities. Getting back to the subject at hand, I could NEVER afford a cake with my salary. It would take me 4 months to acquire enough money for a fancy cake like that. But then again, I believe that cakes are for eating! Well, only about 40% of those cakes are cake, at best. The rest is a mix of Home Depot/Radio Shack spackled with fondant. I take it you showed-up with it in your hot little hand (or a sack of the bits), ready to do the civic duty, right? I discovered that it was possible now to do it online. Saved my day. Shouldn’t the caption say “birthday cake” not “birthday gift”? 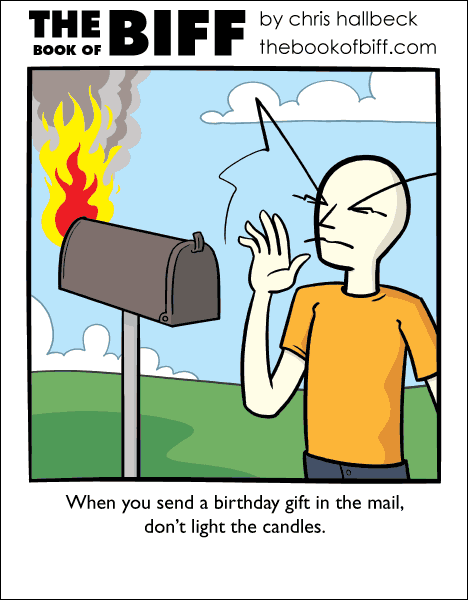 Who puts candles on a gift?